Students connected to Grace Chapel are encouraged to get involved in everything we do as a church community. In addition to being a part of the life of the church, we have specific events and programs intended to help teenagers grow in their walk with Christ through small group specials, retreats, service opportunities, mission trips, special events, and our student leadership team. HSM Sunday Mornings are primarily about growing closer and going deeper as students make connections with peers and caring adults through small groups and grow in their understanding of the Christian life together. 9:15am-10:30am: Students are encouraged to arrive around 9:00am for breakfast, ping-pong, pool, music and connections with good people. Most weeks we will begin our time in small groups of like grade and gender and lead by leaders passionate about students. This is time to connect regularly with a small group of peers and grow together in faith. During the second half of the morning we gather back together in the Large Group Room for celebration and teaching. After HSM Sunday morning, students are encouraged to join the larger church body for worship during our 11:00am or 5:00pm services. We meet on the upper level of the Grace Chapel church building. 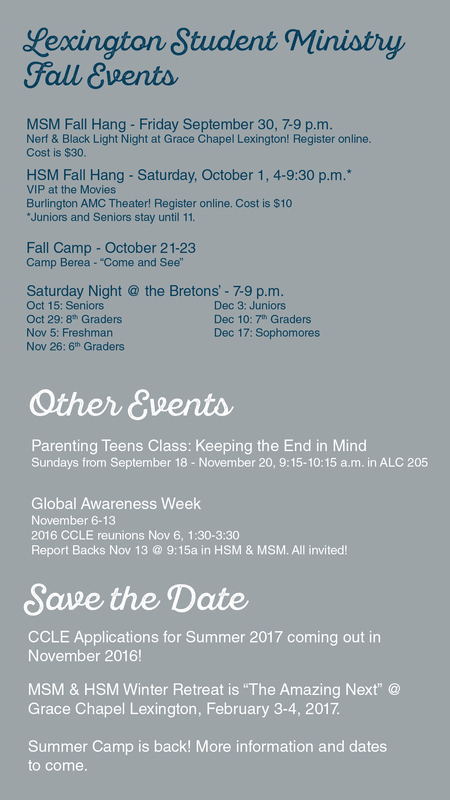 join our HSM parent newsletter!